I am such a huge Disney fan, visiting Disneyland is pretty close to the top of my Disney Bucket List. So I jumped at the opportunity to participate in the 60 Days to 60 Years of Disneyland Celebration! I have always been a devoted fan of Walt Disney and I am so happy to share history from a year when he was so involved in Disneyland. 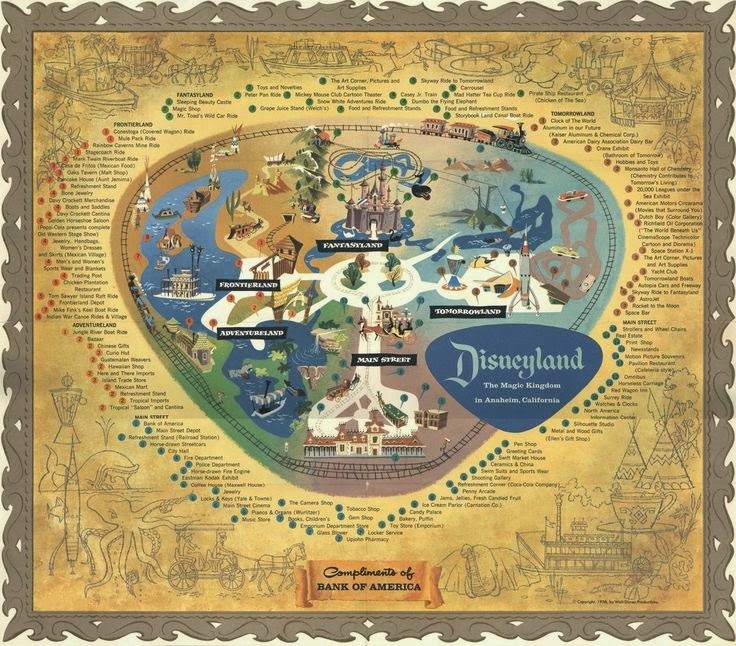 1956 was the first full year that Disneyland was in operation. There were so many naysayers just waiting for it to fail, and the Disney Company was determined to prove them all wrong, needless to say they were successful. In a press release issued by Disneyland, Inc. by the time of Disneyland's first anniversary almost 4,000,000 had visited the park, 41% who were from outside of California, as a matter of fact Disneyland had already had visitors from 64 different countries - including Saudi Arabia and the Soviet Union. Celebrities, world leaders and even Vice President Richard Nixon had visited Disneyland since it opened. Actually, Disneyland was the largest single enterprise attraction in the Western Hemisphere! And "Walt's Folly" appealed to adults as much as it did to children, if not more so. According to the same press release four adults visited for every child. Adult admission to the park was $1.00, with the option of buying a "Plus 8" add on for a total of $3.00 and later in the year the number of attractions for the add on was increased to 10. Guests who visited the park spent an average $2.37 per person - and that included admission, parking, rides and souvenirs! 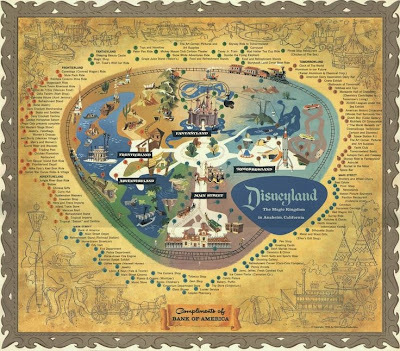 In 1956 Disney completed a $2 million expansion which included the Disneyland Skyway, the Rainbow Caverns Mine Train Ride, the Indian Village and War Canoes, Storybook Land and Tom Sawyer's Island. 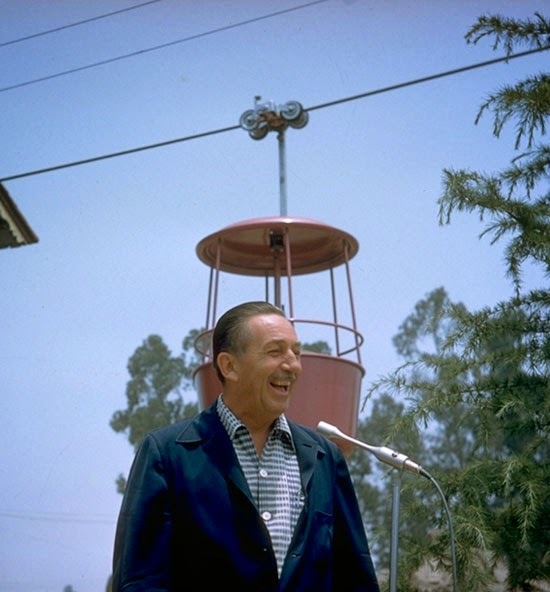 As Walt promised, the park continued to grow and refine itself to offer unparalleled entertainment during it's first year - and continues to do so to this very day. June 23, 1956 the Skyway attraction opened in Fantasyland, it remained there for almost 30 years. Notice the joy in Walt’s face as he opened the attraction from the chalet-like setting. The most popular attractions during the year were Peter Pan in Fantasyland, the Advertureland Jungle River Boat Ride, the Disneyland and Santa Fe trains (which I am sure made Walt very happy), and the Autopia Freeway's miniature autos in Tomorrowland. 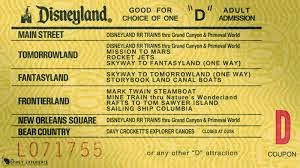 Disneyland introduced "D" Tickets in 1956, these tickets were for Disney's more popular attractions and included: Astro-Jets, Keller's Jungle Killers, Santa Fe & Disneyland Railroad Fantasyland Station, Skyway, Rocket to the Moon, Storybook Canal, Mine Train, Pack Mules, Stage Coach, Mark Twain, Tom Sawyer Rafts, Indian War Canoes, Junior Autopia and Jungle Cruise. "D" ticket attractions cost 50 cents in 1956. Not much by today's standards, but a much bigger expense for a family of 4 at the time. July 1956 the Barstow Family of Wethersfield, Connecticut won a Disneyland Dream vacation in a contest sponsored by Scotch Brand Cellophane Tape. Here is a link to the family home video of their trip, it really gives you a feel for what Disneyland was really like in 1956, and the family is adorable! One last bit of Disneyland trivia, 1956 say Disneyland's first fireworks presentation. The first shows were actually produced by employees lighting individual fuses - can you imagine? It would be a few years before the technology came for the fireworks to be launched electronically and synchronized to music. I hope you've enjoyed taking a trip back in time to Disneyland 1956 with me today. Oh how I wish I could have visited and the time and just caught a glimpse of one of the most amazing men of all time. Thanks for Disneyland, and all of the other amazing things you brought into the world Uncle Walt. Thanks for this history Donna - what a magical year for Disney. I love that picture of Walt, you can see the excitement in his eyes. Thanks Sean! Walt was always childlike in his excitement. I cannot imagine how excited he would be at the parks today! I agree - the joy in Walt's eyes is enough to bring me to tears. He truly loved Disneyland, and I think his joy is contagious still today. Also, it's amazing to see which attractions have stood the test of time. 60 years - amazing! Walt was truly a pioneer Rosanne! I love that even though the park has grown over the years it has remained true to Walt's original dream. "Walt's Folly" not!! Happy first birthday Disneyland; the park's growth in this first few months is spectacular. As Rosanne points out, overall Walt's "babies" have certainly stood the test of time. This may have been the year of the "D" ticket, but Disneyland's early and astounding success is "E" all the way! Thank you, Donna, for the keen research and the magical video peek inside Walt's early dream! It was definitely my pleasure Didi! I love learing about the early days, in particular anything that Walt dreamed of doing - he truly believed "If you can DREAM it, you can DO it!" Thanks Gayle! When I make it to Cali (and force Didi to come with me) I want you to be my tour guide!! I love it, Donna Kay! Thanks for sharing all of that great detail with us! Regarding the Barstow Family, I actually attended a presentation at my local library here in Raleigh, NC where they showed the video about the family and their trip to Disneyland! That was a few years back, great stuff sharing it here! I loved the video Mike! Mr. Barstow did a fabulous job narrating it, it really took you back in time. It's so awesome that you were able to attend the presentation by the family! Thanks for stopping by Jindy! I love all things Disney and cannot wait for the day I actually get to see Disneyland firsthand. The skyway attraction was so cool when it eventually went through the Matterhorn. Thank you for sharing about 1956 and the Barstow family, that footage is awesome. I wish I got to visit Disney as much as you do Dawn! I think it's so great that the family has this footage to share with generations to come.